July marks not only the most important holiday of the year other than Christmas -my birthday- but also our four going on 15 year anniversary. Since we never celebrate anything alone, it was only fitting that the parents and grandma (87!) headed over to Germany to visit most of the entire month separately. Thanks to everyone for all the notes, happy wishes and messages online too! 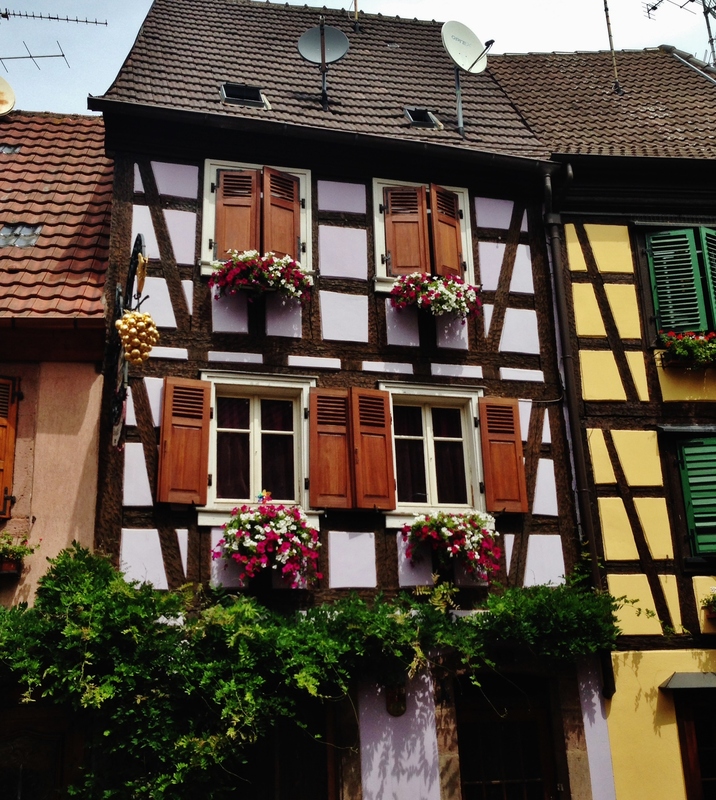 Skipping ahead in our recent travels (I’ll go back to our Swiss trip and more from Germany soon) to a new city not far from Riquewihr where we also took the parents, is Ribeauvillé, France. 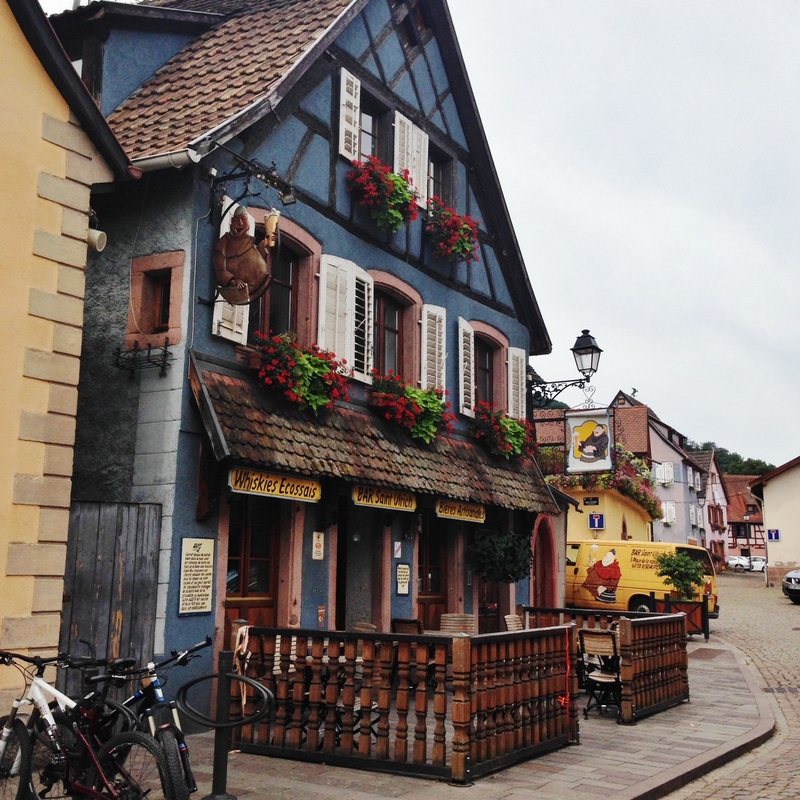 We stayed the weekend with mom and finally found the right way to get to the Alsace Wine Road from Stuttgart, starting with Obernai in our GPS, following the brown signs for the wine route the whole day. 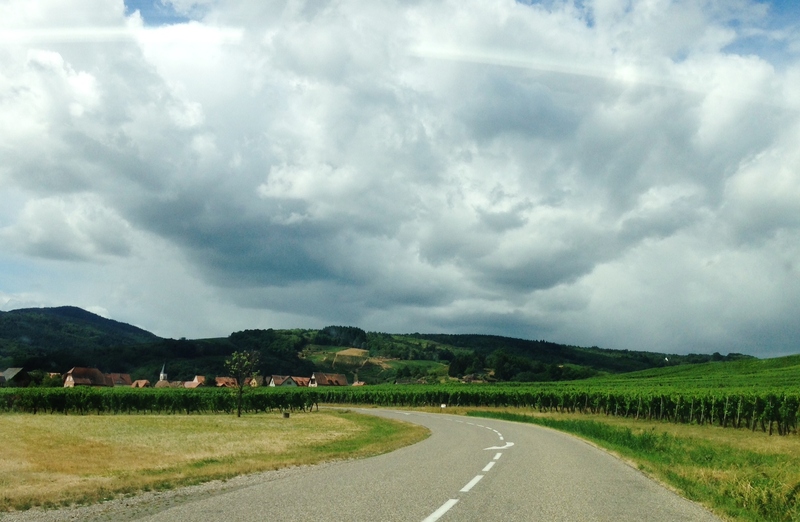 It takes three times as long to get there on the route vs. the highway but there are a million towns along the way to see, as well as driving through the vineyards stopping for wine tastings as you go (free). We found an amazing winery, Domaine Achille Thirion at Saint-Hippolyte that was really good and affordable (4+ euros a bottle). We only popped in to grab a bottle before hitting the hotel where we imagined it would be a bit more expensive in town, but the girl in the tasting room (from Montreal in France learning about wine) mentioned a tasting so we had to stay. We stayed in the center of town, street parking is free where available. It was easy to find a spot. Driving through the small streets in town was another story, we were on roads that appeared to be only pedestrian but nope, that was the way to go. Drive right through the people. The castle overhead Ribeauvillé is Castle “Saint-Ulrich.” Hiking up is possible via marked tails, and I am sure there is a way to drive, but we did not find it. Instead we ventured toward the way home to another castle where driving up the mountain to get to it is much easier. 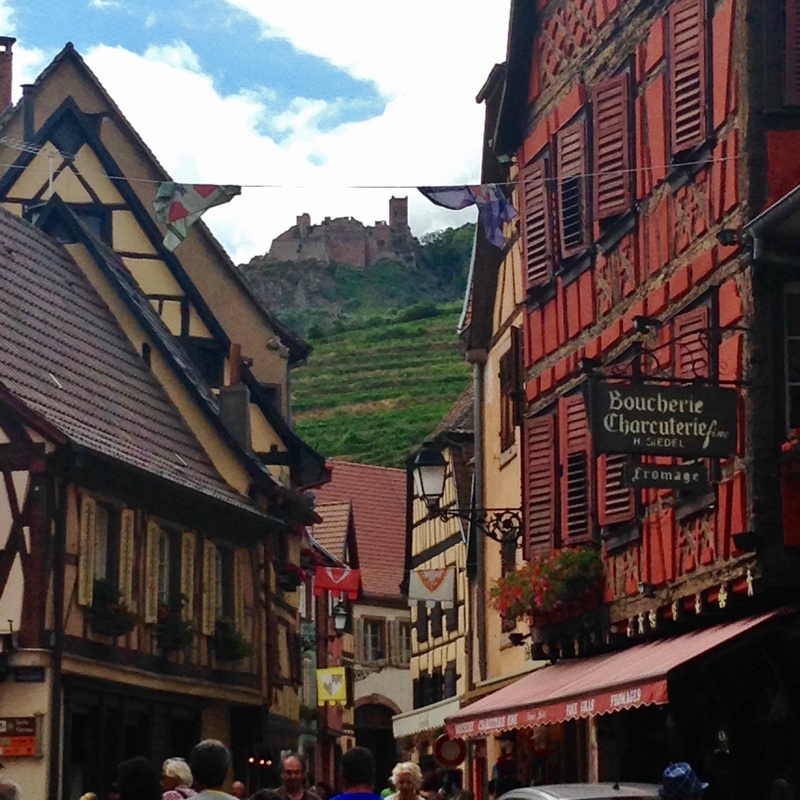 Haut-Koenigsbourg Castle is near the Monkey Mountain (Montagne des Singes) where monkeys roam free, and the falconry show (Volerie des Aigles) both of which are on our list now for next time. The only beer store in Ribouville, Teddy Beer, had a for sale sign on it. Even the hotel was surprised because it was a good store and had only been opened for 3 years. 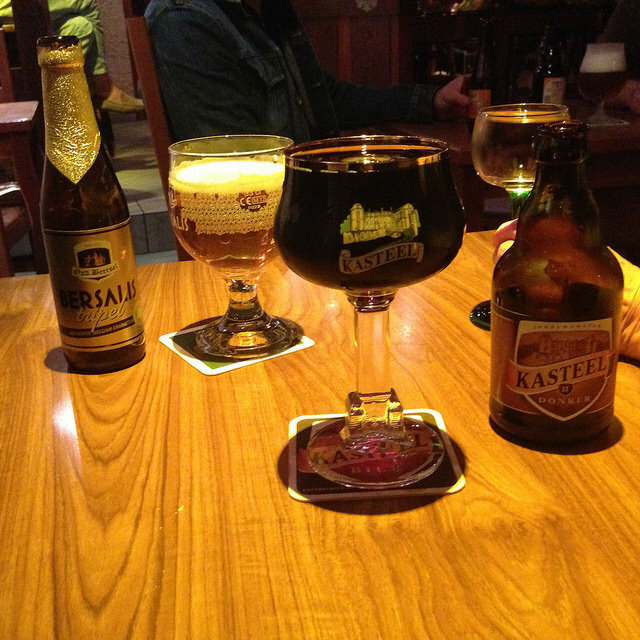 We were bummed but did of course head to the only beer bar in town, Bar St. Urlich. We were actually advised that the owner wasn’t the nicest person, but the bartender we had when we were there late night was really helpful. It seemed to be the only after hours bar where all the local restaurant staff would go for a drink after kitchens closed. The list was decent, loads of Belgians we can’t get in Germany for good prices so all were happy, plus they were open until after 1 a.m. It was a good end to a day of travel.